Are you on the hunt for delicious keto snacks for weight loss? We’ve got just what you’re looking for, and then some. The keto diet is easy when you can eat high fat, low carb snacks that satisfy your cravings. Everyone needs a little pick me up to get them through the day, but instead of reaching for packaged, high-sugar, and high calorie foods, reach for keto diet snacks! These snacks are just as tasty and much better for your health and waistline. They’re perfect if you’re on the go and need to boost your energy throughout the day! If you’re unfamiliar with the keto diet, here’s a quick rundown. The keto diet is a high fat low carb diet, where the body turns fat into ketones, which are used for energy. This leads to an increase in fat burning and weight loss, appetite control, and heightened energy and mental performance. Other health benefits include the improvement of blood sugar levels, insulin levels, and blood pressure. One of the best ways to maintain the keto diet is making sure you have keto snacks around. This will ensure you’re not snacking on bad-for-you foods that contribute to weight gain. Kept snacks are easy to whip up and you never have to deprive yourself. They’ll give you the boost you need while keeping your weight in check. When you combine whole foods and keto together, you have a killer weight loss duo! Whole foods help you lose weight by eliminating calories and added sugars found in packaged and processed foods. You should be eating as many whole foods as possible if you want to increase your health and decrease your waistline. Here’s a list of the best keto snacks that are made up of whole foods! People who have busy schedules and are always on the go often reach for the easiest thing they can find while they’re bustling around the city. This often means a muffin from Starbucks or a bag of chips from the convenience store at the end of the street. This can lead to a lot of excess weight without you even realizing it. On the go ketogenic snacks keep you fueled as you go about your day, without packing on the pounds. And the best part is they are just as delicious as the snacks you’d usually reach for on the go! There you have it, 50 on-the-go keto snacks for weight loss you’re going to love! Whip these up the next time you feel the munchies coming on, or batch make them to grab when you’re running out the door! 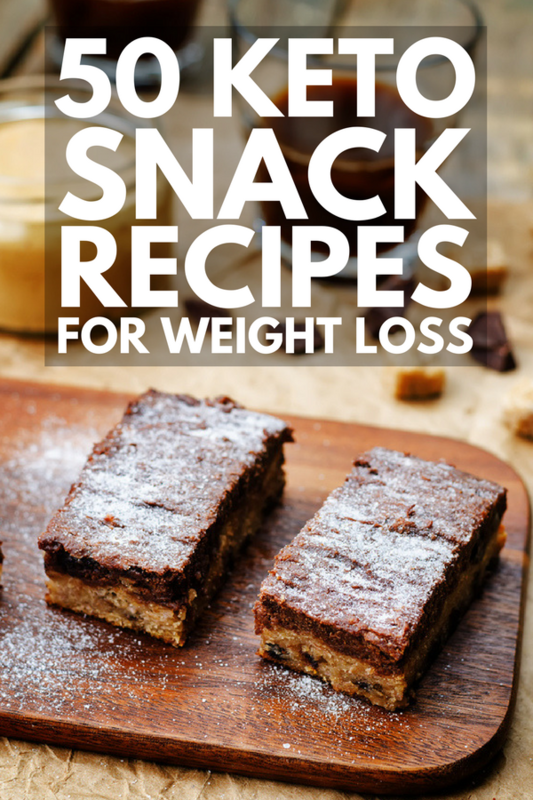 If you loved these keto snacks for weight loss, please make sure to share this post on Pinterest! And if you’re looking for more keto diet tips, make sure to follow our Health board on Pinterest!